The OroTox sample from the Sulcusfluid is brought into the liquid of the reagent with the yellow cap which produces sulfur-containing compounds to a yellow color change. The more intense the color change the higher the concentration. H2S and other sulfhydryl compounds such as Methlymercaptan (CH3SH), dimethyl sulfide (CH3SCH3), dimethyl disulfide (CH3SSCH3) and Gliotoxin will be detected. These are generated exclusively by anaerobic bacteria and fungi in the oral cavity. In general, the lower the test results, the better the dental and oral health. The results are the most reliable for about 2 weeks after a dental hygienic treatment. 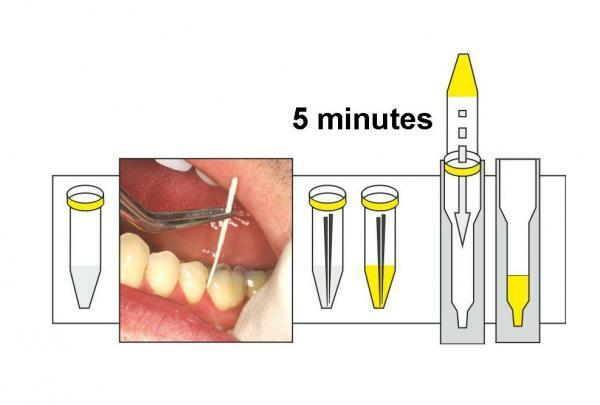 In order to demonstrate the anaerobic germs, an absorber pin is inserted from the paper for about one minute in the periodontal pocket of the eye-catching tooth. This pin is then placed in a test tube containing the indicator fluid which produces thiol-containing compounds on a yellow color change. The higher the concentration of toxins, the greater the discoloration.